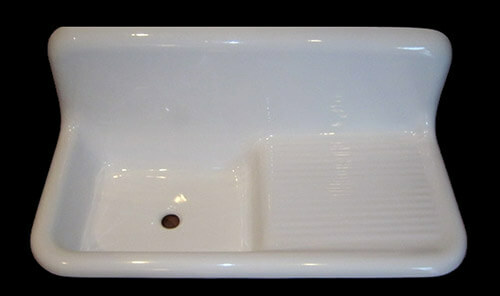 Home » Kitchen Help Category » Faucets » Reproduction 1940s-1950s farmhouse drainboard sink now available — big news! Readers who have been searching tirelessly for a vintage drainboard sink in good condition for their kitchen remodel may have cause to rejoice — there are two new options to consider. We are particularly intrigued by the sink re-creation above: Until now, the only way to get this 1940s-1950s style of counter top farmhouse drainboard sink has been to find it vintage — there have been no reproductions as far as we know. While this reproduction is manufactured using gelcoat and fiberglass reinforced polyester resins — not porcelain enamel on cast iron or steel like the originals — it is nonetheless a quite interesting alternative. Wethinks: Maybe the biggest new-product news of the year so far. Here is the other reproduction sink from Nelson. Read on for background from the owner of the company now making these sinks. Oh and — colors? They are possible, he says! 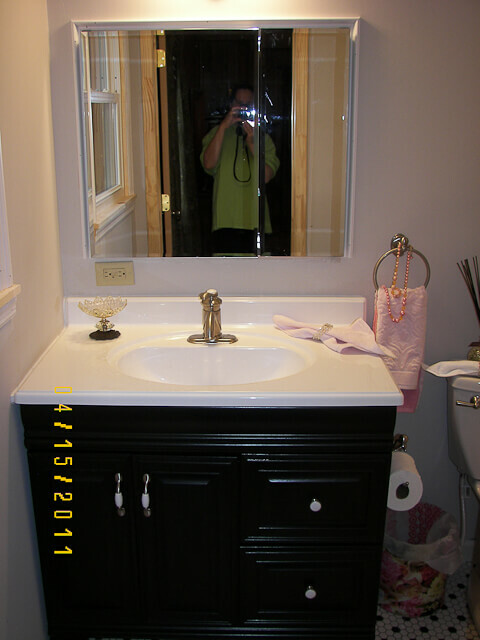 Many thanks to reader Tamara, who tipped us off to these sinks now being manufactured by Nelson Bath Tub, Inc. This Gainesville, Florida company’s longtime main business has been refinishing and repairing porcelain, acrylic and fiberglass bathtubs, as well as providing associated services. But now, they are expanding their work to include molding classic kitchen drainboard sinks from original cast iron sinks. 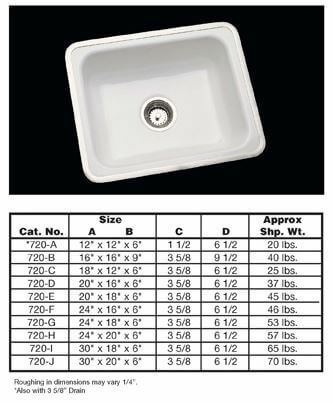 The sinks are made in the USA and ship free to the lower 48 states. Nelson’s Bathtub Inc. has been serving the bathtub refinishing and repair industry for over 25 years. 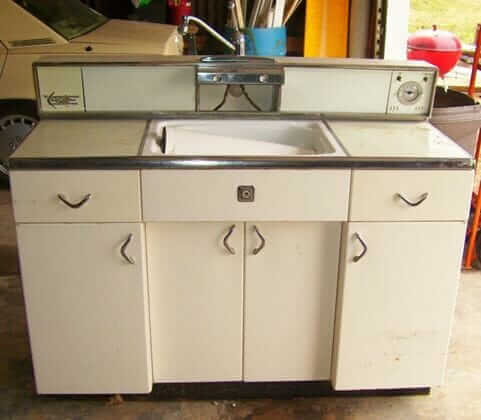 Throughout these years, we have seen an ongoing demand for the restoration of vintage sinks and have provided this service to our customers only after expressing to them the following concerns: We do not recommend the refinishing of kitchen sinks because the process does not hold up well in the kitchen environment. When subject to pots, pans, sharp utensils etc., the refinished fixture may chip and as a result will begin to delaminate. We also could not provide a warranty as a result of this inevitable circumstance. 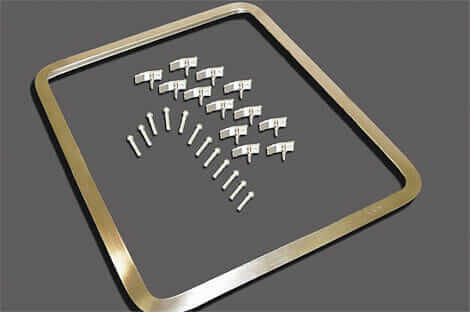 As far as I know, we are the pioneer of this process of molding from the original drainboards. Our process extracts all the minute details that make these old sinks unique and this is reflected on each one of our finished products. 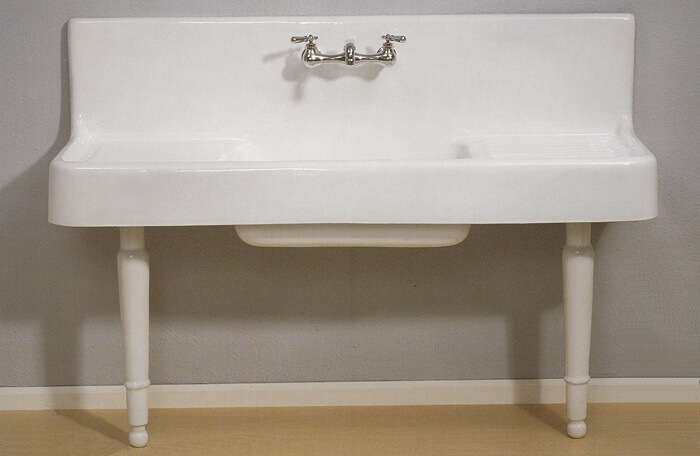 Our reproduction drainboards offer beauty, durability, and a viable cost effective option to the vintage homeowner or renovator desiring one of these vintage style sinks. We use only the highest quality materials to manufacture our products right here in the USA. Very good questions, and ones I certainly should have addressed in my initial response. Our reproductions offer excellent durability and ease of cleaning and the surface hardness, abrasion resistance would be comparable to that of acrylic which is commonly used for modern kitchen sinks. The sanitary grade gelcoat used to manufacture our sinks has been used in the bath ware industry for many years and provides a very reliable finish. Initially, our reproductions were thermoformed from acrylic but we found that the acrylic lost the details of the originals and the finished sinks didn’t have a vintage look or feel. On the other hand, the gelcoat reproductions can be very difficult to decipher from the originals. The only real giveaway would be by looking at the backside (concealed side) of the sinks. Obviously, the weight difference between our reproductions and that of the cast iron sinks are substantial, but once installed you would have a difficult time telling the two apart. The reproduction sinks are reinforced well and definitely don’t have a plastic feel. I actually had a client bring an original fixture to me for refinishing and wanted a reproduction of it as well (they needed two sinks) and when they came to pick them up asked, “Which one is the reproduction?” I feel very confident that consumers of our products will feel the same and we offer a money back guarantee for their peace of mind. Sink from Pam’s mom’s bathroom — similar process, although Nelson’s sinks are heftier, they say. I was still kind of *skeptical* about a fiberglass sink reproduction. So, I called Kent Nelson in Florida, and we had a great talk. After some discussion, I kind of came to understand that a way to *compare* how his sinks would look would be to compare them to the sink top on the vanity in my mom’s bathroom — from Lowe’s — shown above. EXCEPT, Kent says that his sinks are fabricated on to a much heftier substrate… and that the gel coat (shiny glossy) finish on top is several times thicker. I was actually visiting my mo’s the day that Kent and I had this conversation… I went into look at her sink… and you know, I would be quite *okay*, I think, with a kitchen sink that looked like the bathroom sink, only constructed to be more hefty. Kent says his hefty reproductions are hard to distinguish — visually — from the originals, and looking at my mom’s Lowe’s sinktop, I can definitely see how this is possible. Kent does warn that you should not use abrasives on his sinks. They should not soak up stains. The gel coating may get dulled after eight or ten years — a kitchen sink is such heavy use. I’d say “baby it” — but it is a kitchen sink, after all, and a kitchen sink should be a… a work horse. Love this one, in particular — nothing like it on the market today that we know of. –>> Read all our complete page about Farmhouse Drainboard Sinks here. we pulled out the identical double sink, double drainboard from a house we bought to use as a rental. It came with the metal cabinet that someone had tried poorly to spray paint in brick red. My hubby loaded the sink/cabinet and was on his way to the dump and I was about in tears. The sink is in great shape with just a couple small worn spots. We are going to be doing new counters and floors soon to our own kitchen and I want it for my sink. IF I can’t convince him (he likes stainless steel sinks), at least I want it to go to a good home, not the dump. Me, I’ll take it! I’m not joking. My house is 100 years old and want to reintroduce proper period elements. Absolutely fabulous vintage repros. Wish I was redoing my kitchen. where is the price/purchasing information for the 66’double bowl drainboard sink? Nancy, the bold bright blue text is all hotlinks — will take you to Nelson’s Drainboard Sinks. This company also advertises on my site — it has an ad in the right-hand sidebar.